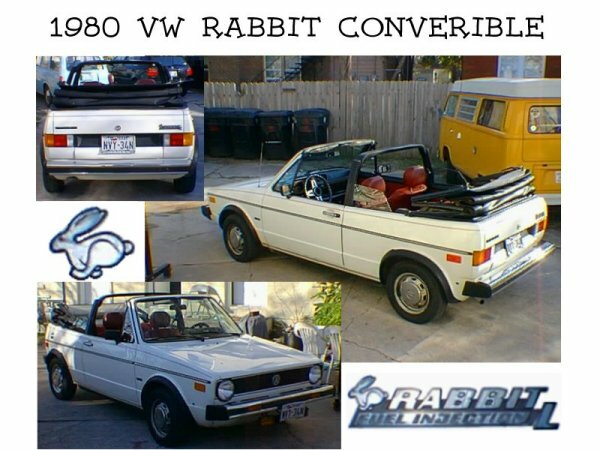 I had been thinking over the last few weeks of 1999 about getting a Rabbit convertible, and perhaps trading someone the GTI for it. Well, I didn't find anyone too interested in a trade, but I did find this 1980 Rabbit convertible about 3 miles from my house! I had noticed it in a parking lot with for sale signs in it, but the parking lot had chain link fence all around. After several attempts to get a look at it in the evening, my wife and I finally were able to get in the chain link fence on Sunday afternoon to get a look. It was impressive! The for sale sign said thinks like "Classic", "85k miles", and other expensive sounding adjectives. I called the number and had to leave a message. After almost four days, I didn't hear back from anyone about the Rabbit, and figured I wouldn't hear anymore about this Rabbit. Then I got the phone call! I heard all about the car, all the maintenance that had been performed, learned it had been garage-kept, etc. I knew it was going to be out of my price range when I asked him what he was asking for it. (I had figured between $2500 and $3000.) He said that they had been asking $1800 for it (it had been sitting in that parking lot for 3 weeks) and had 2 people look at it but pass, so he was asking $1700, and might even be willing to go lower than that. I got this big goofy grin on my face and gave a thumbs-up to my wife, who had been eavesdropping on my side of the conversation. It was in the same range as what I could quickly sell my GTI for! I asked the seller if he would be at all interested in a trade, but no, this was his wife's car, and she had recently purchased a new Camry. We made plans to see it on 01-01-2000. When we showed up at his house, the car was out front, freshly washed. We shook hands, got the keys, and started the car up. It sounded great! Everything was working on the car - the heat, the A/C, all the lights, and all the little things that tend to break on a 20 year old VW. The engine compartment was very dirty in comparison to my GTI, but not extreme. He told us to drive it around, get it up on the freeway, etc. We still had the top up. My wife was very impressed with how little wind noise there was. It was real steady on the road. We got it up to 70 on the freeway, and there still was very little wind noise. The only noticeable problem was a very pronounced clunking from the right front of the car. I figured it was the CV joint. We returned to the owner and did another walk around. There was no rust under the car. There is some rust around the rear window, but that looks like it's been sealed fairly well. I got on the ground and could not see any signs of a bad CV joint: no ripped boots, no grease slung under the car, etc. We asked him about this, and he says his mechanic looked at it and told him it's "nothing to worry about". I go ahead and tell him we are interested and would like to purchase the car, but need to sell my GTI first. I ask if I could put a few hundred dollars down on it to hold it and get the rest together in 2-3 weeks. He discussed with his wife and said that wouldn't be a problem, but that I had only three weeks. Since they were willing to do that for me, I said I would be willing to pay the $1700. As we were leaving, he gave me the maintenance records that they had kept since buying the car in 1985. That evening, I put several ads out on the Internet for my GTI, and called several of my VW buddies and started spreading the word. I looked through the records he gave me.. it was amazing! Records of the 60k service, a/c compressor replaced, transmission replaced, etc. Every little thing that had been done to the car was there. They had been taking it to one of the most expensive places in town, but also one of the best. That made me feel pretty good. On Monday, 01-03-2000, I got some unexpected money in, and was able to pay for the rest of the car. I took delivery of it at noon. I was so excited! I had not told my wife that I got it, so she was very excited when I picked her up from work that evening. I since have figured out the knocking noise was simply a bad strut insert. After NTB told me it would be over $400 for new struts all the way around, I figured I would do it myself. I installed the front inserts ($20 each) on January 8, 2000. You can read about it on my Rabbit Tech Page. I will install new rear inserts at a later time. Last revised: January 5, 2000. Comments? Questions? Email me at kittman@swbell.net!